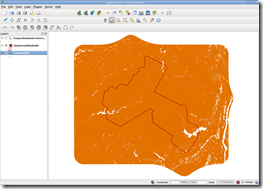 Round 2 in which ArcGIS throws in the towel. This is a follow-up to my previous post where I matched up ArcGIS and QGIS in a clipping contest. One of the commenters on that post expressed some concern that there might be “…something else going on…” with my test, and I agreed. It was unfathomable to me that an ESRI product could be out-done by such a wide margin. 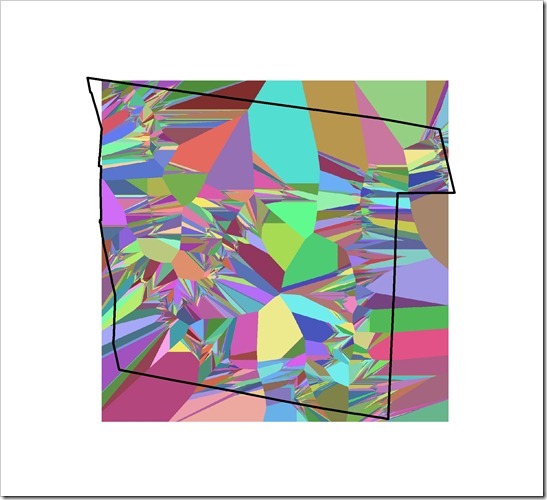 Knowing that ArcGIS often has problems processing geometries that are not squeaky clean, I began my investigation there. 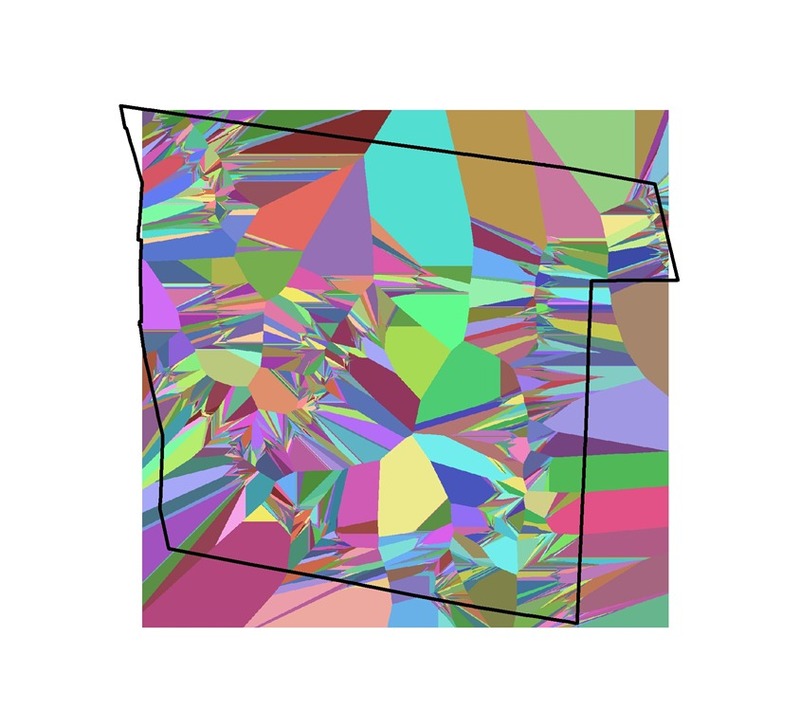 I ran the original contour layer through ArcToolbox’s Check Geometry routine, and sure enough, came up with 5 “null” geometries. I deleted those bad boys, and ran it through ArcToolbox’s “Repair Geometry” routine, and then ET GeoWizard’s “Fix Geometry” routine for good measure (These may or may not be identical tools, I do not know). No new problems were found with either tool. Now granted, this is much better than the 12 hours it took the first time I ran it, but still, no cigar in the end. Giving QGIS a chance to show it’s stuff, I used Windows version 1.5.0 to run a clip on the same files, on the same machine. QGIS took all of 6 minutes and 27 seconds to produce a new, clean contour layer. I ran this through the same geometry checks as the original contour layer, and came up with no problems. My goal here is not to jump all over ESRI and do a dance in the end zone. I would really like to figure out what’s going on. As I’ve said before, I’ve had problems in the past with ArcGIS producing bad geometries with its Clipping process (and other tools, too). But the fact that another product can handle the same set of circumstances with such ease baffles me. If any of you have better results than I did, or find any faults with my files or process, please let me know and I WILL make a note of them here. Thank you. This entry was posted in GIS and tagged ArcGIS, Clip Test, QGIS on June 11, 2011 by Don. 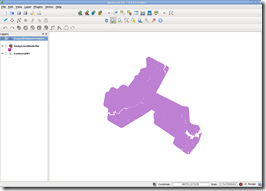 Is QGIS a viable alternative to ArcGIS? I’ve never enjoyed working with contours. They seem to bog down my system more than any other layer type I work with. However, most of my clients are so used to looking at USGS Topo maps they expect to see them on at least one of the maps I produce for them. I recently worked on a project covering a five-town area in the Catskill Mountain region. The large area covered, and the ruggedness of the topography was proving exceptionally troublesome in processing their contours. So much so that I decided to look at other options to get the work done. I’ve used a variety of GIS tools over the years, but do most of my paying work exclusively in ArcGIS. It’s what I’m most familiar with, it does (nearly) everything I need it to do, and therefore provides my clients with the most efficient use of my time. However, in this situation that was not the case. 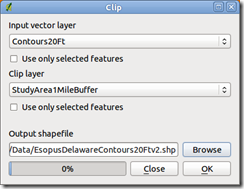 The one geoprocessing operation that frustrates me most often (in ArcGIS) is the Clip operation. It seems to take more time than most other geoprocessing tools, and often results in bad geometries. This happens so often, I usually resort to doing a union, and then deleting the unwanted areas of the Union results. For some reason this works much faster, and with more reliable results than doing a Clip. I started out with ArcGIS, and loaded up my 20’ contour lines and a 1 mile buffer of the study area to which I wanted to clip them. I began the clip operation 3 times. The first two times I had to cancel it because it was taking too long, and I needed to get some real work done. Curious to see how long it would really take, I let the process run overnight. The progress bar kept chugging away “Clip…Clip…Clip…Clip…”, and the Geoprocessing results window kept updating me with its progress, so I assumed it would complete eventually. In the morning, I looked in the Geoprocessing results window and found it had run for over 12 hours before throwing an error, never completing the clip operation. The error message said something about a bad geometry in the output. Really, no surprise there. The next day I decided to give QGIS a shot at it. I copied the two shapefiles over to my 6 year old lappy. 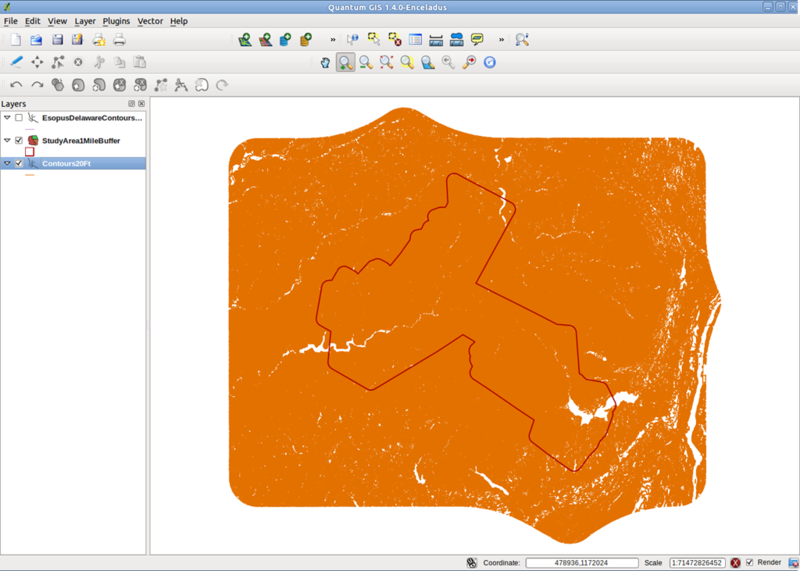 (The contour.shp file was 1.3GB) fired up QGIS, and ran the Clip operation on the two files. This time it took all of 17 minutes and 21 seconds to get a new contour layer. So, who’s the winner here? Was it a far contest? My take-away is, ESRI really needs to do some work on its Clip geoprocessing tool. As I said earlier, it is slow, and results in bad geometries more often than any of their other geoprocessing tools I use. 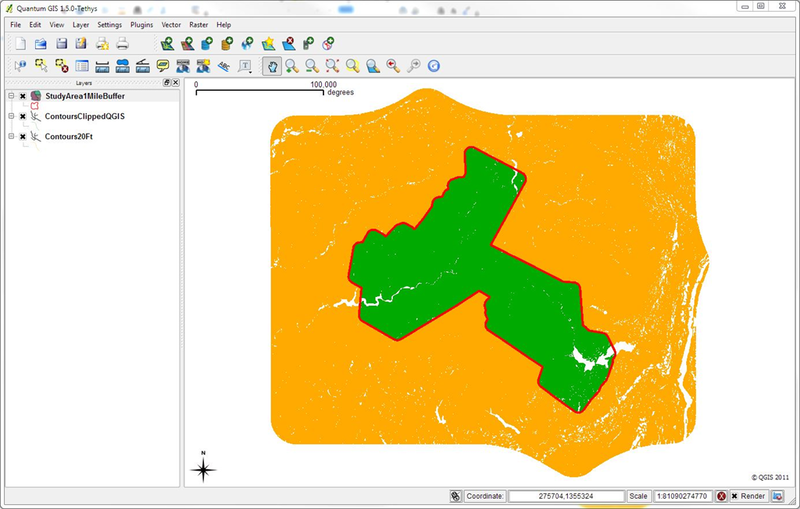 This entry was posted in GIS and tagged ArcGIS, Clip Test, QGIS on June 10, 2011 by Don. 1 – Add a new “Short Integer” type field to your attribute table (I usually call mine "Dup"). 4 – Check "Show Codeblock"
This will populate your new field with 0’s and 1’s, with the 1’s identifying those fields that are duplicates. 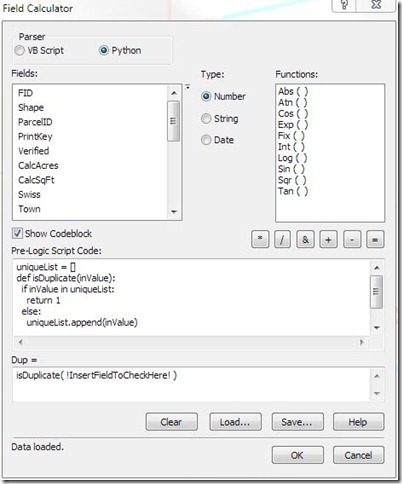 This entry was posted in GIS and tagged ArcGIS, Python on May 20, 2011 by Don. One of the more popular analyses I’m asked to perform for my clients is a viewshed analysis. Beyond simply identifying what areas of a town are visible from roads or other public viewpoints, I’m often asked to help identify, and sometimes rank, areas that are most worthy of protection. One way to help a town identify and evaluate these high priority vistas, is to identify prominent ridgelines and the areas around them that are susceptible to inappropriate development. One way to mitigate the impact of development on highly visible ridgelines is to make sure new buildings do not break the horizon line – the point where the ridge visibly meets the sky. Since most local zoning codes restrict building heights to 35-40 feet (in my client towns, anyway), producing a vertical buffer of 40 feet helps to identify the areas susceptible to such an intrusion. The steps to produce such a vertical buffer are not overly complex, but I have not found them readily available online. So, for your benefit (and my easy reference) I outline the process here. 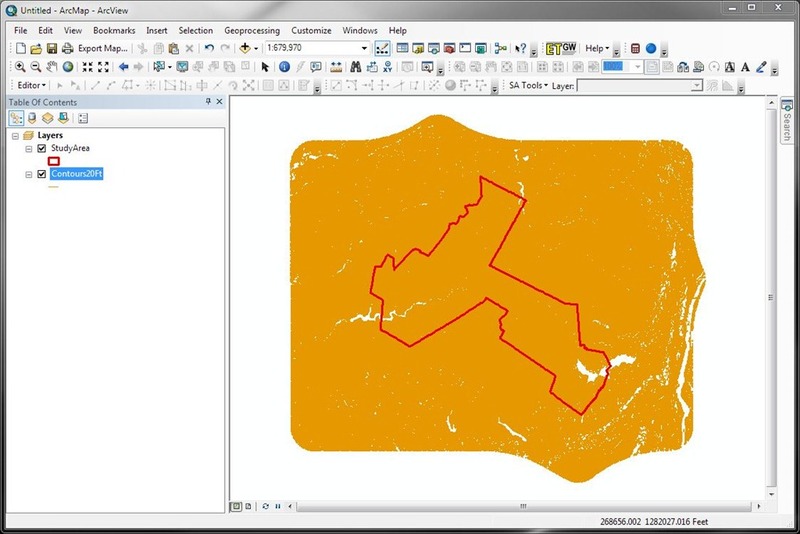 This DEM must be an integer raster for one of the following steps, so start off by using the raster calculator. Use the INT( “DEM” ) expression, where “DEM” is the elevation raster that you want to convert from a floating point to an integer raster. Ridgelines are often generated using watershed boundaries, with extensive field checking to identify the more prominent features. 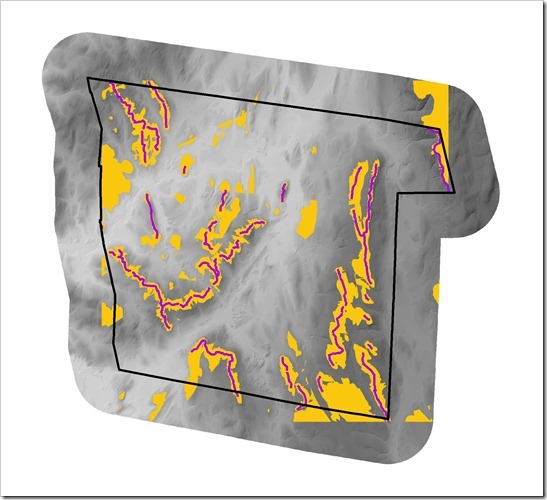 For these calculations, the ridgelines must be in a raster format that includes the elevation of each raster cell. 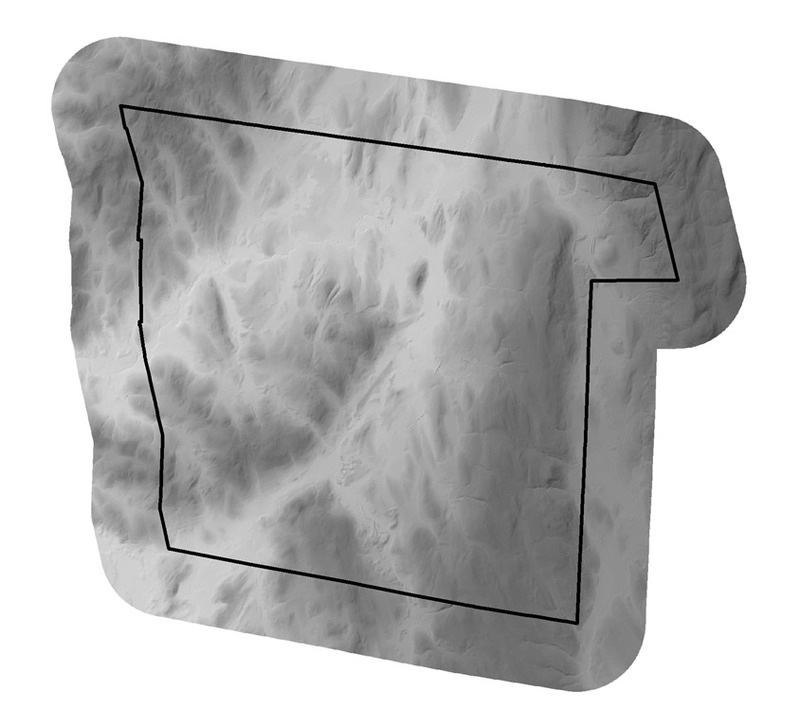 To convert a line-type ridgeline to a raster, first buffer the ridgeline to produce a polygon feature (I typically use a 20 foot buffer) and then use Extract by Mask. Use the Integer DEM produced in the first step as the input raster, and the polygon buffer of the ridgelines for the feature mask data. This is where the need for an integer raster comes into play. 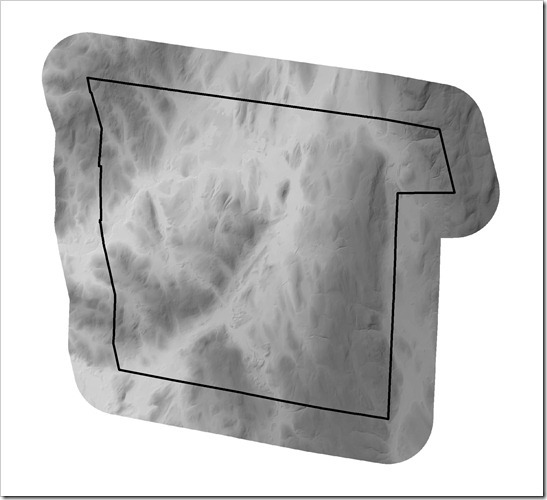 Simply use the Ridgeline raster generated in the previous step as the input raster, and choose the elevation value as the Source field. 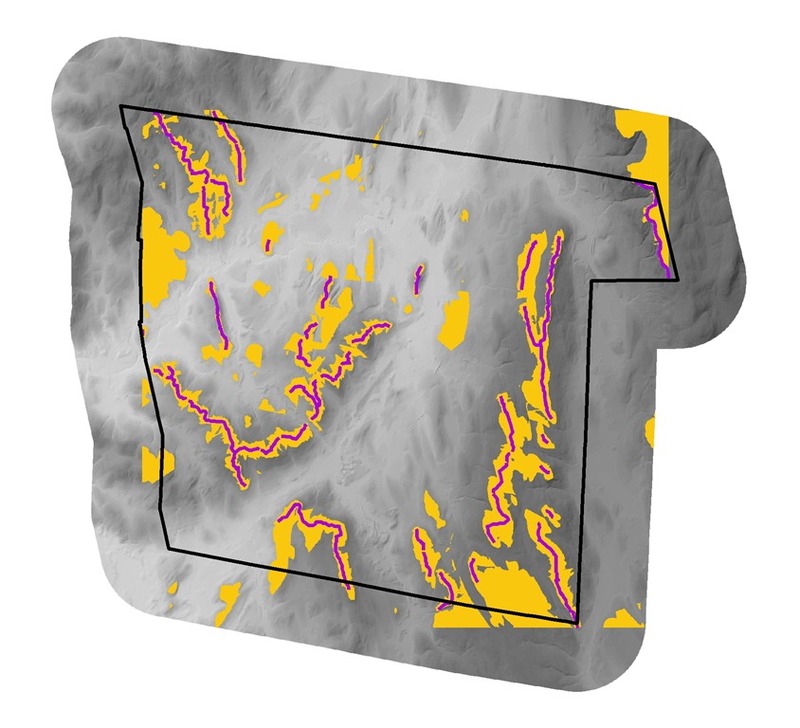 This process will generate a new raster that covers the entire study area, with each cell holding the elevation value of the ridgeline raster that is nearest to it. Use the Raster Calculator to generate a vertical buffer of the ridgeline. The expression will look something like this: “IntegerDEM” >= (“RidgelineEucoAllo”-12) where “Integer DEM” is the DEM produced in step 1, “RidgelineEucoAllo” is the Euclidean Allocation raster produced in step 3, and “12” is the height of the buffer you want to produce. In this case, the raster measurements are in meters, so using a buffer value of 12 results in about a 39 foot vertical buffer. This allows me to identify areas where there is the potential for a new building built to the maximum allowable height to break the horizon line. Once the buffer is generated, there is usually some cleanup required. As you can see from these results, buffers are generated in areas not connected to the ridgeline areas we want to focus on, so I’ll delete these before moving on to the next steps in this town’s viewshed analysis. I hope this is helpful, and as always, I welcome any comments and feedback. 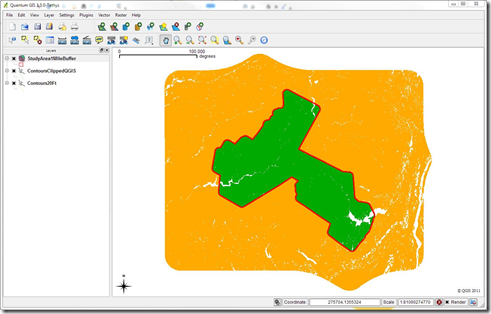 This entry was posted in GIS and tagged ArcGIS, Spatial Analyst on April 23, 2011 by Don.